In 1994 Australian runner Cathy Freeman won a gold medal in the Commonwealth Games. When she celebrated by carrying the aboriginal flag in a victory lap, an Australian official reprimanded her. The official was loudly condemned by the public and Freeman became a national hero to Aussies both black and white. This cartoon won first prize in the National Rotary Cartoon Awards. 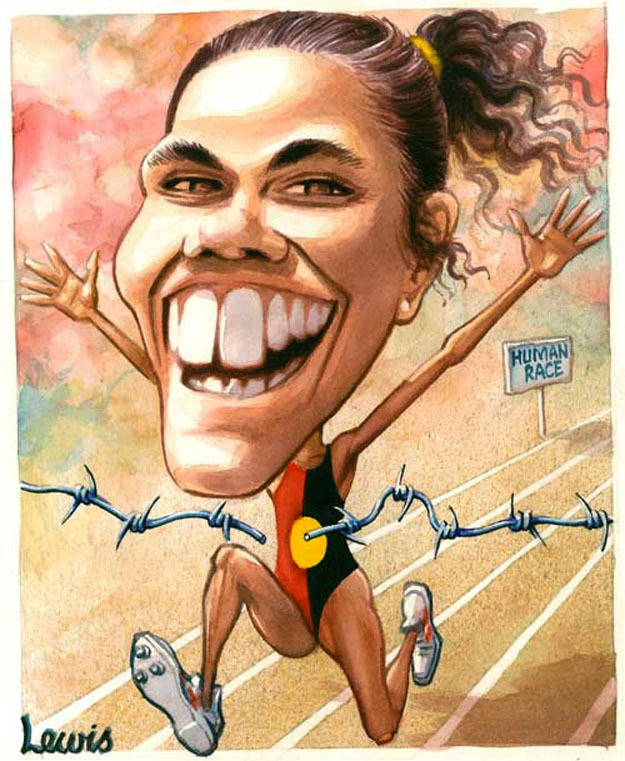 This entry was posted in Editorial Portraits and tagged aboriginal, aboriginality, australia, Cathy, Cathy Freeman, Commonwealth Games, flag, Freeman, games, human race, race on December 5, 2012 by Art by Peter Lewis.